As of January 2019, the very popular and highly innovative Euro Souvenir Banknote (also known as '0 Euro Banknote') is finally available to order in Ireland! Since its invention in 2015, this creative concept, that has been specifically designed for visitor and tourist attractions, has become very popular in different EU countries in a very short time, whereby proving its commercial success and popularity with visitors and collectors alike. Tourist sites and visitor attractions that have produced Euro Souvenir Banknotes for their own business are stunned regarding the success of this new type of souvenir and the positive feedback they receive. So it does not come as a surprise to see the sky-rocketing numbers of tourist sites to sign up for it and dedicate a banknote to their own attraction in order to market it on-site to their customers and provide them a beautiful keepsake and memory of their visit. 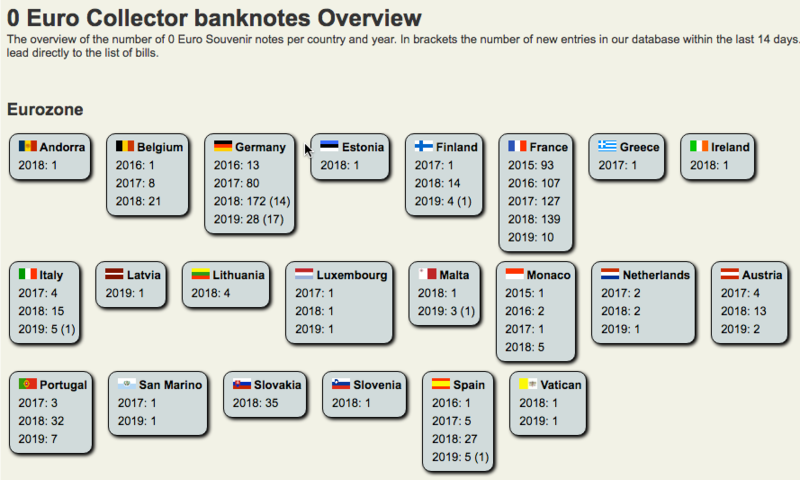 Here you can see an overview of the numbers of sites and locations where Euro Souvenir banknotes were produced since 2015. The picture shows the EU country, followed by the year, and next to the year the number of different different banknote motifs produced in that year. The numbers are growing rapidly, which shows the immense success of the Souvenir Banknotes. One important aspect to this concept is that it is new and highly innovative. It is great to publish news and generate content for marketing and the social media channels. A look at our Press section shows just a fraction of the TV news, newspaper and online news reports about the 0 Euro Banknote in the international news. Being in the news is one of the best marketing tools, because that way, a huge number of people can be reached who get curious and want to learn more. It helps to increase the footfall, plus allows to generate complimentary revenue from the sales of the Souvenir banknotes. If you want to be a Pioneer in Ireland and benefit from the advantage of early adopters, please get in touch and let us discuss your plans. We are happy to help you making your own banknote a great success.